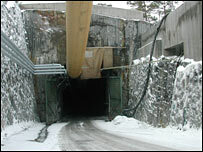 An unprepossessing tunnel entrance set in low forest on the western coast of Finland marks the probable final resting place of the country's most dangerous nuclear waste. While British authorities agonise over what to do with the legacy of half a century of nuclear power, Finland is one of a handful of countries which has embarked on the journey towards a "final" waste solution. Enter the 6.5m-high, 5m-wide (20ft-high, 16ft-wide) Onkalo tunnel, and you would drive down a spiralling track which will eventually stretch 5km (3miles) through solid rock, reaching a depth of 500m (1,600ft). The first travellers to go down the tunnel will be investigators aiming to demonstrate that the rock is structurally sound enough to proceed with the disposal of spent fuel rods containing plutonium and other unpleasant materials. If they were to turn up a positive result, and if government agencies grant the necessary licences, the first canisters of spent fuel would begin rolling down the tunnel about 15 years from now. As things stand, Finland is on course to become the first country in the world to entomb its most troublesome nuclear waste in a designated final resting place. The Onkalo facility is run by the company Posiva, and the system it uses is a Swedish concept called KBS3, which Sweden's proposed repository would also implement. The other country close to solving its problem, the US, is exploring a different technology at its Yucca Mountain site. "The safety concept is based on so-called 'multiple barriers'," says Timo Aikas, Posiva's vice-president in charge of engineering. "One barrier is of course the solid stable crystalline rock. 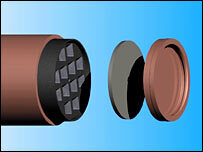 The remaining barriers are engineered barriers, the most important of which is long corrosion-resistant copper canisters, inside which we put the actual fuel rods." 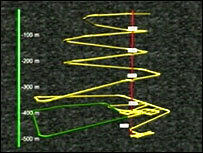 In this vision, the bottom of the Onkalo tunnel would sprout a grid of horizontal shafts. 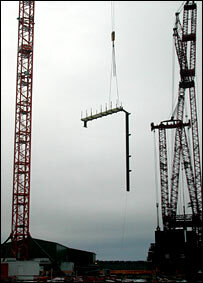 Canisters containing the spent fuel rods would be deposited into holes in the bottom of each shaft. The canisters would nest in a bed of bentonite clay, which swells when it absorbs water. This comes with twin benefits; cushioning the cargo from geological movement, and ensuring there are no voids where substantial quantities of water can penetrate, corroding the canisters and carrying away their radioactive contents. As each canister goes in, the tunnels would be filled up again with yet more clay and rock. By 2100, the repository would be complete, access routes would be filled and sealed. What to do next would be a decision for Finns of that era; but the concept is designed to allow them, if they want, to cover the tunnel mouth, landscape it and walk away, leaving no entrance into the rock and no sign of the material buried underneath. A granite curtain would have descended on the first civilian nuclear epoch. Some of the radionuclides - atoms with unstable nuclei that undergo radioactive decay - in spent fuel rods remain radioactive for more than 100,000 years. In that time, could not even the tiny quantities of water which the bentonite allows through penetrate the copper canister shells, allowing dangerously active isotopes to escape? Timo Aikas believes not. "We have seen that the copper canister will not be corroded away," he says. "We have native copper in the Finnish and Swedish bedrock, which means we have good conditions for such things. We know from corrosion testing that 1.5cm [thickness] of copper would be enough from the corrosion standpoint for times longer than 100,000 years, but we have 5cm (two inches) copper." The time period is so mind-bendingly long that it will almost certainly take the world through another ice age; which, if history is a guide, would bury Finland and Sweden under 2-3km of ice. The huge pressures created by this ice will certainly deform even bedrock, compressing the copper canisters and fuel rods which lie inside (the rods are contained within channels bored into a steel cylinder). So concerned have European authorities been about this that the European Commission's Institute for Energy in the Netherlands commissioned pressure tests on the steel cylinders. "The maximum [ice] thickness is 3km, which equates to a pressure of 30 megapascals (MPa)," says the engineer in charge, Kalle Nielsson. Combined with pressure from groundwater and the tight embrace of bentonite clay, the cylinders would experience a total pressure of 45 MPa, which corresponds to the pressure you would have 4,500m (15,000ft) down in the ocean. In tests, the cylinders stood up to a pressure three times that value before failing. "I would say that it's safe," is Kalle Nielsson's conclusion. "And we have made a probabilistic calculation - 'what is the probability that it would fail at this 45 MPa?' - and it is less than one out of a million canisters that would fail. So I would say as a concept that it's safe." Technology is only one part of the Finnish solution; the other vital component is finance. "Our current cost estimate for this 'funeral' is about 3bn euros," says Timo Aikas. Three billion euros is a significant sum of money. Is this another example, then, of the state having to pay vast sums to clean up a nuclear industry which has in the past generated profit for private ends? The signs point in a different direction. The advent of commercial nuclear power to Finland in the late 1970s saw the establishment of a fund to pay for the eventual clean-up. "Every year, we have re-calculated the fund based on the amount of spent fuel accumulated," says Timo Aikas, "and at the moment the fund is approximately 1.4bn euros." The money has come from generating companies through a small levy on the price of nuclear electricity. It is, perhaps, the sort of measure which current British leaders looking at a waste disposal facility bill in the region of £10bn (14bn euros) would wish their predecessors had chosen to implement. Even if the KBS3 concept is sound, even if Finland has the money to implement it, there is a question over whether Eurajoki is the best place to put it into action. Greenpeace, which has been spearheading a campaign against the new Olkiluoto-3 nuclear reactor taking shape just a kilometre from the Onkalo site, is concerned that the local geology may not be the soundest available. "When the site selection started in Finland, the nuclear industry said they would find the best geological site," says energy campaigner Kaisa Kosonen. "And, eventually, they chose the site on sociological reasons, because eventually Eurajoki was the first municipality to say 'ok, we can take it', and there wasn't an active nuclear opposition in this area." That lack of local opposition may be down to the fact that nuclear reactors have stood in the area for three decades, gaining acceptance for an industry which has maintained a good local safety record and brought employment. "It boils down basically to trust," comments Timo Aikas. "When you make a decision concerning this kind of thing, which takes us to 2100 when the final sealing takes place, there will always be uncertainty. So you have to have trust." Kaisa Kosonen urges caution; the case for Onkalo, she says, is not proven. "I would like to see much more research done and not having this hasty process," she says. "And I would not want this marketed as 'waste issue solved', because it's not." But Timo Aikas believes his system and his team deserve the trust they have found in Eurajoki, and that Onkalo will prove as safe a resting place for highly active radionuclides as can be found, barring any surprises with the local geology. And he urges other countries, Britain included, to take a decision and find a solution. "Nuclear waste doesn't go away," he reflects. "And if we just keep it in stores above ground we just push the problem to the next generation. It's much more responsible now to develop solutions on how to take care of it."